A JLARC study begins when the legislature identifies a topic for review. The General Assembly typically directs studies by passing joint resolutions of the House and Senate, or by including language in the Appropriation Act. A typical JLARC study evaluates whether a state agency or program is accomplishing legislative intent and using resources effectively and efficiently, or analyzes an issue of concern related to the core functions of government, such as education or economic development. Each study is assigned to a staff team, which prepares a detailed work plan. 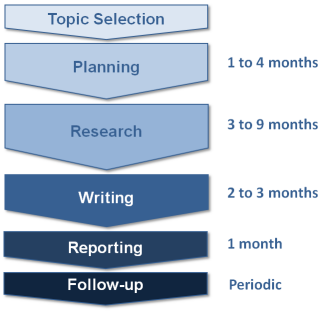 The work plan identifies the specific issues or questions to be addressed and the research approach to be used. JLARC’s management team approves each project work plan. The research for a study may include interviews with agency personnel, collection and analysis of data from agency records, written or electronic surveys of employees and/or customers, site visits, observation of processes, analysis of financial records, review of relevant literature and other research (such as a similar study in another state), and analysis of secondary data. After the team completes its research, it prepares a report that is reviewed internally and subjected to quality assurance standards. The draft is then distributed to appropriate agencies for their review and comment. A revised draft, which also contains agency comments, is presented to the Commission at one of its monthly public meetings. The study leader briefs the study findings and recommendations at the meeting. The Commission authorizes publication of the study as a legislative document. The printed report is distributed to members of the General Assembly, the governor, and other interested parties. All JLARC reports are published on the JLARC website.